Today the sun returned, but we benefitted greatly from the impact of yesterday’s rain. Trowelling was easier and it was possible to clean the SW corner of the square and its paving. This revealled no end of problems ! 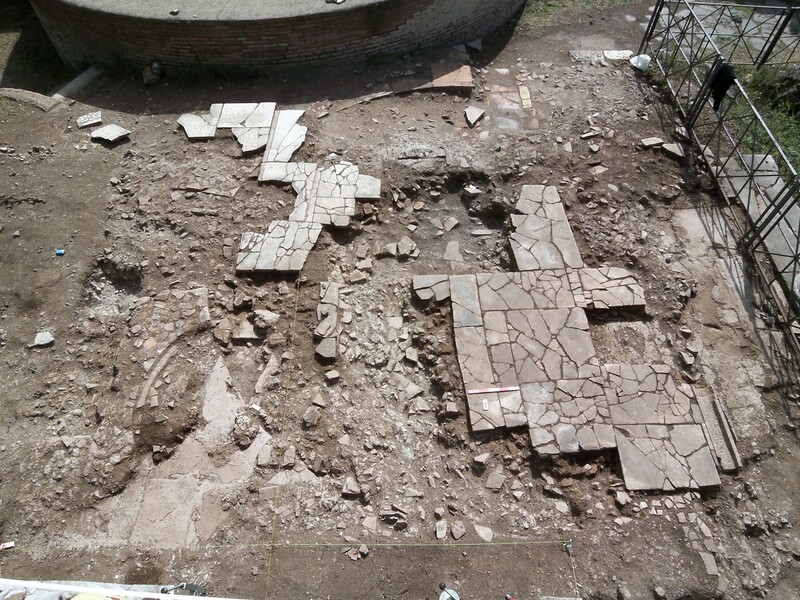 It is still early days, but it looks like we now have a mortared forum floor laid down in the 4th c. using recyled blocks which left their imprint, which were later removed and re-laid at a higher level, with an intermediate fill of collapsed walls which sits between the mortar and the present paving. How confusing. Probably the original filling dumped in the baths below the first forum had subsided over time and a relevelling of the paving was necessary. This might be the context of our restoration inscription of AD 415-18. Elsewhere on site we are trying to join up different trenches so that we have one single area of excavation. This is not easy as the levels are taking longer than anitcipated to dig. Any experienced diggers or seriously fit amateurs would be very welcome on site this week as volunteers. Shelagh French our logistics person has gone home unfortunately. This has depressed everyone a little bit, though we still feel fortified by a week of her square meals. Because of the rain last week work is behind so a small group of us are going out on site for Sunday our day off. Others plan a final day off in Rome, or a rather night out, as a group left for Rome at 11pm yesterday and still have not returned to camp. I hope they didnt get frozen as nights are now very chilly. See the Day Off page for Helen Harrington’s account of last week’s visit to the highlights of Early Christian Rome. it was really interesting to work at your side; thanks a lot for your “Gastfreundschaft”. I really enjoyed working at your side and staying at your place – so thanks for having me.